Welcome to Shirley Chauffeurs... and Congratulations on your forthcoming wedding. 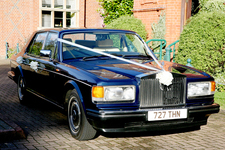 If you are looking for something special for your wedding day transport, and maybe something a little different, you have come to the right place. Although we have our own ideas of the service we will provide, we are happy to discuss your own particular requirements and tailor-make a package just for you. Drivers are members of the British Chauffeurs Guild.